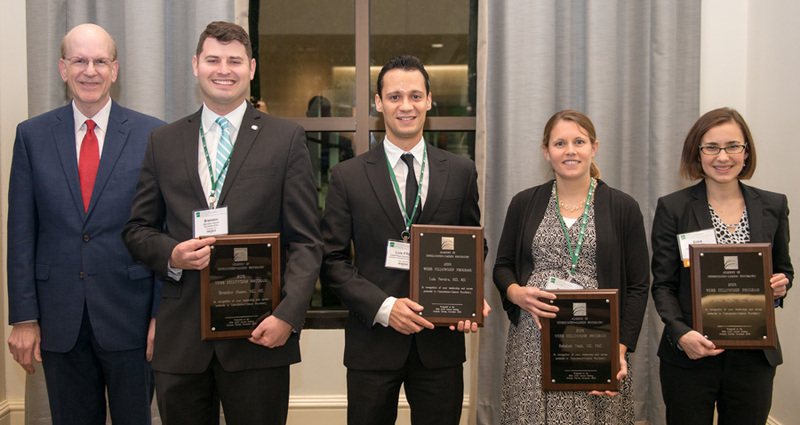 The Webb Fellowship Program is designed to support a select number of outstanding advanced residents and fellows in C-L psychiatry at an early stage in their career. 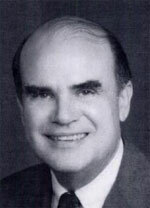 The program is named for William Logan Webb, Jr., MD, FACLP, president of the Academy 1986-87. Dr. Webb had an impressive career in C-L psychiatry and was among the early strong advocates of its subspecialty designation. He was involved in the study of pain, became an international authority in psychiatric ethics, was a highly respected teacher, and participated in symposia concerning coping mechanisms in sick physicians. When terminally ill in New York City, he eagerly became an interviewee for medical students. In 1991, Dr. Webb was awarded the Distinguished Service Medal of the American College of Psychiatrists. Dr. Webb passed away in December 1992 at age 62. For more information about his career and impact on ACLP, please see Dr. Webb’s obituary [PDF] in the May 1993 issue of Psychosomatics, authored by M.J. Martin, MD, FACLP, president of the Academy 1973-74. Mentorship. Each Fellow will have two designated mentors: one from their sponsoring institution and one from the ACLP. Networking. Each Fellow will be provided structured and supervised involvement in the national CLP organization, ACLP. Sustained involvement. Each Fellow will be substantively involved in significant ongoing ACLP projects. Affirmation and consolidation of professional identity. Each Fellow will experience collegial interactions via ACLP and through exclusive Webb Fellowship educational experiences. As leading C-L psychiatrists of the future, Webb Fellows will be especially well positioned to play key roles in educating non-psychiatric physicians who treat patients with psychiatric disorders. Webb Fellowships are one-year appointments. Each Fellow will have a designated ACLP mentor in addition to their institutional mentor. The institutional mentors will typically be C-L faculty psychiatrists at the Fellows’ home institutions. The ACLP mentors will be senior established members of the Academy. The Academy of Consultation-Liaison Psychiatry will underwrite each Fellow’s organizational membership for one year and annual meeting registration fee. Support of attendance of the Academy annual meeting at the beginning of their Fellowship appointments will be covered by the Fellow’s sponsoring (nominating) institution. The sponsoring institution will also provide a mentor for the Fellow. The Academy will underwrite travel costs for the Fellow’s attendance at the second annual meeting. This includes coach airfare, hotel, and expenses for meals and incidentals. Be an advanced psychiatry resident (PGY-3 and later) or CLP fellow. Psychiatrists who have recently (within one year) completed fellowship training in CLP may also apply. Submit the online William Webb Fellowship Application, which includes questions for your major areas of interest, your plans and goals, how the fellowship will enhance your career development, what support your home institution will provide, and the name of your proposed institution mentor. You must attach your CV. Have no more than two (2) CLP faculty members at your home institution submit a recommendation for your candidacy using the online William Webb Fellowship Recommendation form. No more than two recommendations per candidate are permitted. Annual deadline for application is July 1. Sponsoring institutions may nominate more than one applicant, but only one applicant can be selected from an institution.